After Alan Peters and James Krenov, Richard Williams is the name that I've heard mentioned most frequently as a source of inspiration for makers who lean towards contemporary style. Given that there must be a good few years between the first two and the last, this is both interesting and encouraging for a new generation of craftsmen. As there is something of the showman in all furniture makers, especially those who choose this route for a career, it's not uncommon to come across a fair amount of chest-puffing from time to time. In modern parlance you could call it 'attitude'. Add the word 'problem' and you begin to understand why some make a fuss and others just make it look easy. 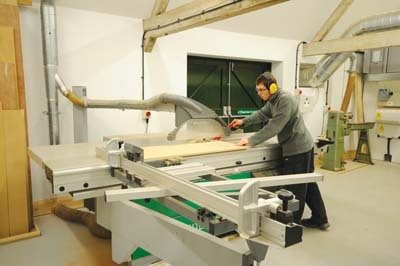 Richard's new workshop is equipped with at least one of everything, including a separate veneering prep area and a machine shop away from the cabinet room. Bathed in natural daylight, it has to be workshop heaven. The story behind the move from a rundown industrial estate to this incredible barn conversion wouldn't look out of place in an episode of Grand Designs, with all the impossible hills to climb along the way. The practically derelict shell of the building and accompanying land is part of the Portman Estate, in Buckinghamshire. In what's best described as a philanthropic approach, Lord Portman and his estate managers agreed to renovate the dilapidated building, secure in the knowledge that the perfect tenant was ready to move in. Fast forward three years and both parties, it seems, are in clover. 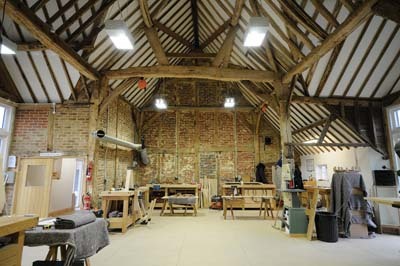 The team of six makers and one apprentice had only been in the building for two weeks when we made the trip to Beaconsfield to view what Richard had described back in the summer as his dream workshop. New benches were being made as well as old bench tops being passed through the speed sander for a new lease of life. The week before, Richard had an open weekend to which he invited all the people who had listened to him talk about little else but the move for the past three years. A list of 1,600 customers and interested parties that was 20 years in the making were invited. 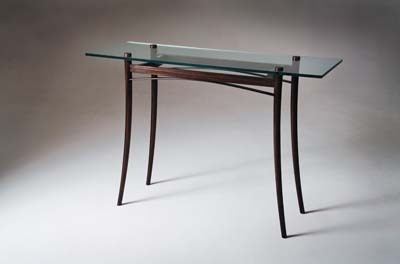 On the day, he sold three pieces of furniture, although it was not intended to be a selling exhibition, and took orders to fill the last available spaces in the diary for 2011. Morale is high and the team is fired up and looking forward to producing furniture once again as the move has inevitably taken up a lot of time. Workshop manager David Hancock said: "I can't wait to get on with building some furniture. There's still such a lot to do but some of it might have to wait." Richard described the move as being like: "Open heart surgery without the general anaesthetic. The business you have known for the last 20 years or so is being dismantled piece by piece right in front of you and reassembled somewhere else." Was it stressful? "Not in the least. We had waited so long and were enjoying every minute. I can't see us moving from here." The six-figure sum he has invested certainly suggests he's here for the duration. On the subject of design he admits to developing a house style in the early days of his career but no longer feels the need to progress with this approach. He rarely does speculative pieces now due to lack of time. "Two to 300 hours is realistically how long it takes to make something special and it's hard to find that amount of time in the year. Perhaps having my own bench might change that but I have no desire to exhibit for a while. "With next year accounted for I don't feel under pressure to market. In fact I don't advertise at all. I have great relationships with my customers. A mutual trust is important and that seems to have them coming back year after year. What is important is having clients that believe in the business and what it represents." Richard admits to developing empathy for design and recognising the need to work within an established environment. Simply relying on the juxtaposition of old against new is not really designing. These are interesting times for furniture makers as there is plenty of new talent on the horizon. The old guard, it seems, is not aware of the influence they've had on makers like Richard. As a national collection their work is not documented anywhere near enough and as individuals they are the sole custodians of the work that has influenced this generation of makers. In his freshly painted office, six Guild Marks hang on the wall and another three await frames. So with this pedigree it was interesting to note that the 'K' word was quite acceptable. Kitchens are a no-go as far as some makers are concerned. 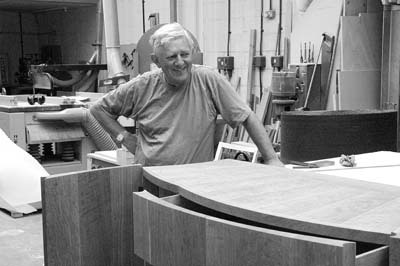 It hasn't always been the case at Richard Williams' workshop but with the right projects they have become as much a part of the business repertoire as bespoke cabinetry. Currently the team, which includes recent signing Peter Rolfe, is gearing up to provide furniture for one of Richard's earliest clients, who wants him to make several pieces for a super yacht - another first for Richard. Commissions like these don't come around that often, but Richard takes it all in his stride. "I didn't set out to break into this market. The customer's needs have grown with our ability to provide the products." He's looking forward to the challenge almost as much as the client is looking forward to seeing what develops. 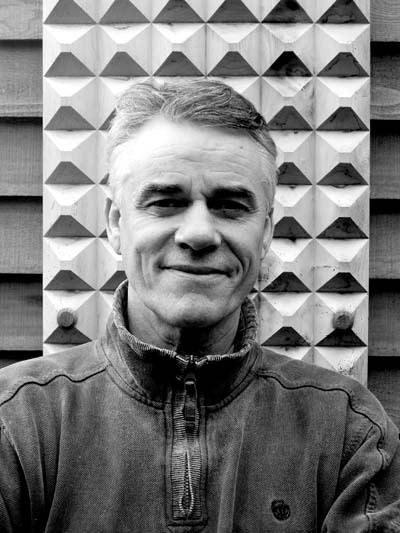 Not being proficient with CAD could be seen as a disadvantage but his talent for generating accurate schemes on paper by hand is a further indication of his ability to interpret customers' needs without the need for digital art. With no exhibitions planned Richard Williams' furniture is set to disappear off our radar then for the time being, unless of course you're willing to join the queue and become a customer. I can think of far worse places to be. 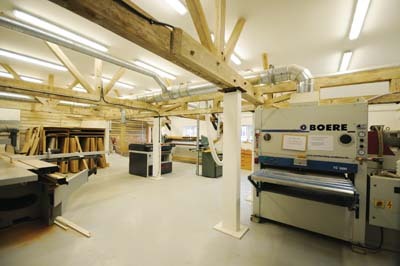 The machines in the workshop include an Altendorf F45 dimension saw, a pad sander, a Robland D630 thicknesser, a Sedgewick planer thicknesser, a Boere speed sander, a veneer guillotine and a veneer press. Richard worked alongside Martin Grierson, having been a student at Bucks New University and admits to Martin being something of a mentor. He calls him: "A man with the ability to design for any situation or style." Ever grateful for the help he received from Martin when starting out, Richard has enough space to rent out a couple of benches in his new premises to two independent makers embarking on a similar career path. "There are obvious benefits but I like the idea of carrying on the tradition really." I can not imagine that they would want for anything. Richard was a visiting lecturer at Bucks, speaking on business issues relating to furniture makers. When it comes to asking for advice I would say they are in pretty safe hands. 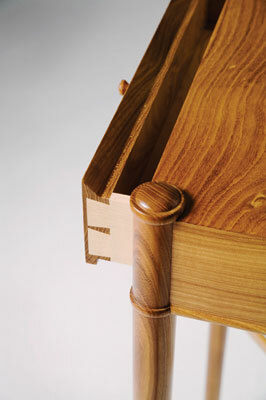 Another great source of inspiration to Richard is Matthew Burt, noted for his use of end grain, crescent expandable tables, CNC routing techniques and overall love of experimentation using native hardwoods.